Rome is known as a gastronomic city in the world and there are a ton of great restaurants in the city. But wherever you go, you will only see tourists… At those kind of places, you can not feel the real ambiance of the city, can you? Therefore, today I’m recommending Hostaria Romana to people who are seeking a local atmosphere. 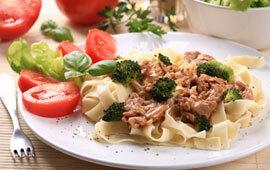 They serve traditional Italian cuisine at affordable prices. Hostaria Romana is located in the very center of Rome and within walking distance from Piazza Barberini and Fontana di Trevi. Hence you can easily stop by after sightseeing around. When you look inside you will see lots of locals, families, groups of friends and even businessmen in suits. 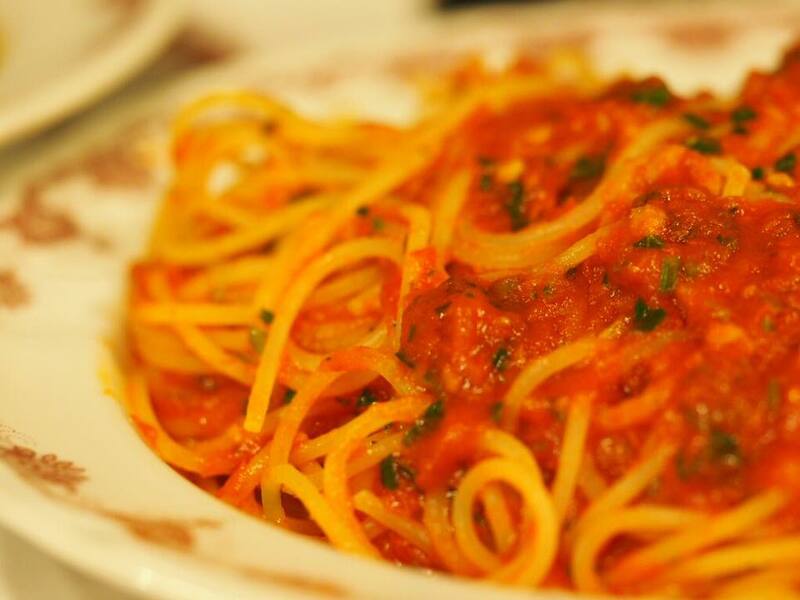 This is exactly where local people come together to have real Italian cuisine cooked in the traditional way. If you would like to try Italian products in a most simple way, the antipasti della casa is a must. 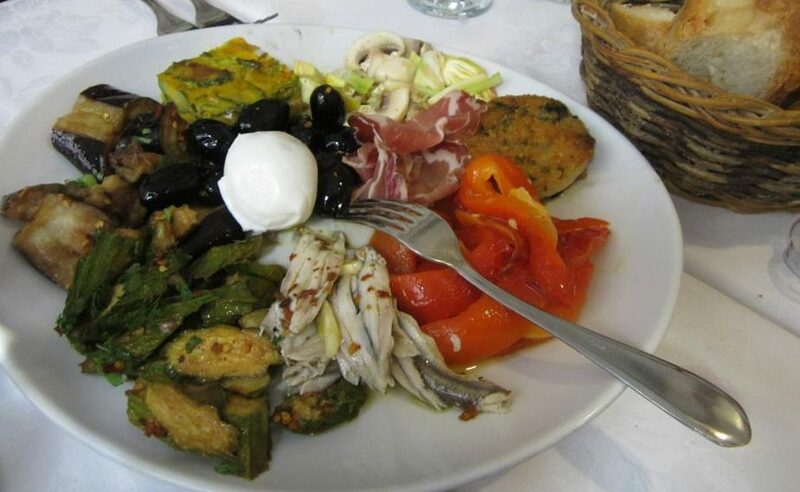 The dish has great selections of mozzarella cheese, fresh ricotta, fried eggplant, zucchini, roasted peppers, olives beans and onions. Please enjoy it with oil or balsamic, but do not overdo it to leave the original flavor alive. Artichoke here is also worth to try. It is very crispy and soft. Even if you don’t or have never eaten it, the one here might change your view. 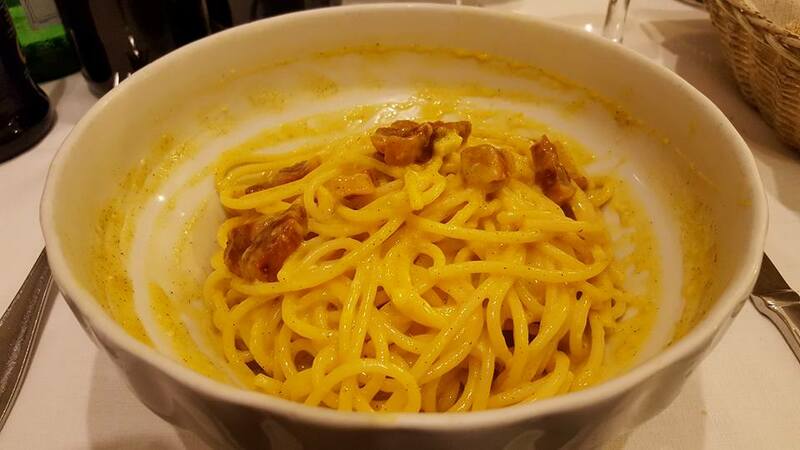 Do you know that carbonara was born in Rome? 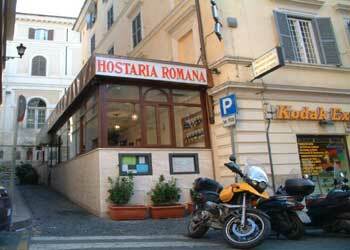 And at Hostaria Romana, you can have the one closest to the original one born many years back. In Rome, they don’t use cream for carbonara, instead they sauté the pasta with pancetta, bacon and extra virgin olive oil. Lastly, they add the eggs. 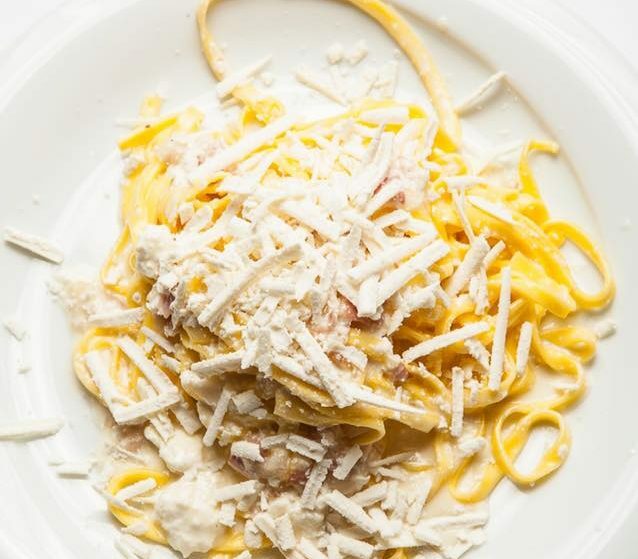 The recipe is simple, while the carbonara at Hostaria Romana is very rich and yummy. The cacio e pepe is also recommended. It is the local roman dish and simply flavored with peppers and Pecorino. They use tonnarelli(a type of Italian pasta which uses eggs for dough) for this and make a great harmony with Pecorino. As well as those menu, Hostaria Romana has a lot of classic Roman options and house red wine can not go wrong with them. The point I have to highlight at last is that they mix the pasta at the hall not in the kitchen. This is how Hostaria Romana make nice vices and entertain their guests. 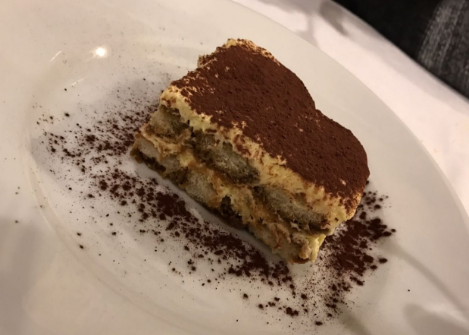 For a dessert you must try the tiramisu. I am sure that the one at Hostaria Romana is different than any others you have ever had before. It comes with a shot of espresso to pour on top and the bitter taste of the espresso and the sweet taste of the cream perfectly match! You will close your eyes and savor every bite. At Hostaria Romana, you will never forget that you are in Italy. There are always funny and charming with you. Sometimes the foods are served with funny jokes and the staff tries to offer you a nice experience not only from the food but also from their hospitality. Even better, they bring you arancini (fried rice balls) before the meal and biscotti afterwards for free. Sometimes the chef offers you a plate of pasta as a sample. What a sweet service it is! And on the wall, there are a lot of graffiti. When you look into each of them, you will know that the graffiti were written by their guests, like signs or messages. This shows how much Hostaria Romana is loved. So don’t forget to bring a marker and add your name into it! If you plan to make a visit to Hostaria Romana at the dinner time, a reservation should be made. But you will not find a reservation form on their website and they don’t take any via emails. If you are staying at hotel, it is easiest to ask the reception for booking or call directly Hostaria Romana. If you don’t have a reservation, please go early around 19:15 when they open. No later than 19:30. That way, you can get a table. 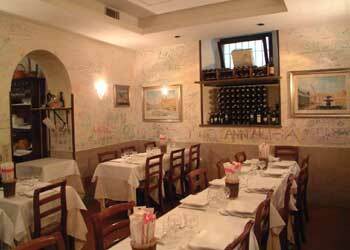 I am recommending is a small trattoria, Acquacotta which is located close to the Synagogue of Florence. 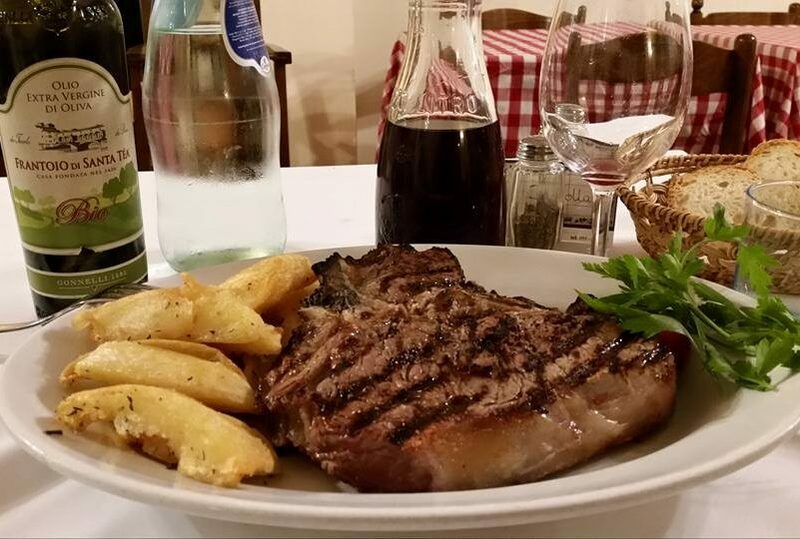 You can have traditional Tuscan cuisine in cozy atmosphere. On the street away from the center, there is a rustic family-run restaurant, Trattoria Ruggero, which is the one I am introducing. You hardly see tourists there and it worth taking a hike to reach it. In Trastevere tucked away from the main tourist area in Rome, there are less restaurants, bars. The place like this is definitely you should go to find local restaurants. Trastevere has many of them and the one I am recommending is Le Mani in Pasta.